Bolt down, stationary design with anchor pads. Unit will be loaded at floor level with fork lift. 54″ product discharge height with a 26” discharge projection into vibratory feeder. A 304 mill finish, TIG welded, stainless steel structure allows for heavy-duty wash down and features a sanitary “no tube penetration” design. All components are mounted on solid, continuous welded stand offs. 304 stainless steel container carriage pivots on a 2” diameter shaft with piloted flange bearings. Dual side mounted nickel plated pivot cylinders for smooth, controlled pivot carriage rotation. 304-2b stainless steel pour hood with continuous TIG welds ground smooth and liner retention guard. Includes a stainless steel, wash-down duty product agitator. Pour hood includes a 12” square SS roller gate with adjustable stainless steel discharge nozzle. Lift & Seal™ System hydraulically seals the container to the pour hood to prevent product contamination and spillage. Heavy-duty stainless steel seal carriage features adjustable sealed SS cam rollers on a SS flat bar track for smooth, dependable operation. 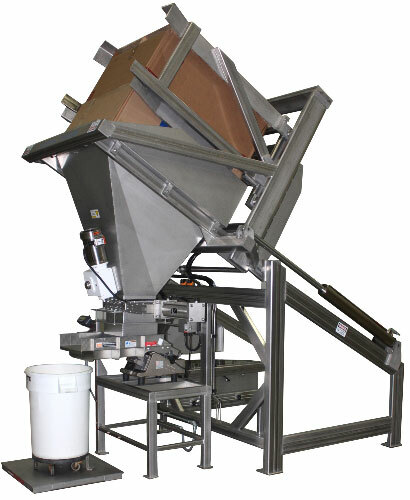 Unit includes a heavy duty, rigidized stainless steel vibratory feeder that dispenses product into a drum weighed by a PLC controlled gain-in-weight floor scale system and weight indicator. NEMA 4X stainless steel electrical enclosure with Panelview control touch screen and Micrologix PLC. Parker hydraulic system with 3 GPM pump, 3 HP motor, and the MTS exclusive two-speed circuit for a smooth, controlled rotation. Includes a stainless steel enclosure to protect the system during wash down.